A very sad story of a family who lost their two beautiful children. Someone they trusted to care for their children turned out to be their children’s killer. A New York nanny who knifed two children in her care to death complained about the youngsters’ mother in her first statement to police, handwritten notes reveal. Yoselyn Ortega, 55, moaned about having to clean the Upper West Side apartment and look after Lucia Krim, six, and Leo Krim, two, despite it being her job. Two days after the attack, shackled to a hospital bed and with a tube down her throat, she dictated statements to NYPD Sgt. Yoel Hidalgo, using an alphabet board. Ortega is accused of stabbing the children multiple times and waiting for their mother – Marina – to come home and see the aftermath. The suspected murderer then plunged a knife into her own neck. 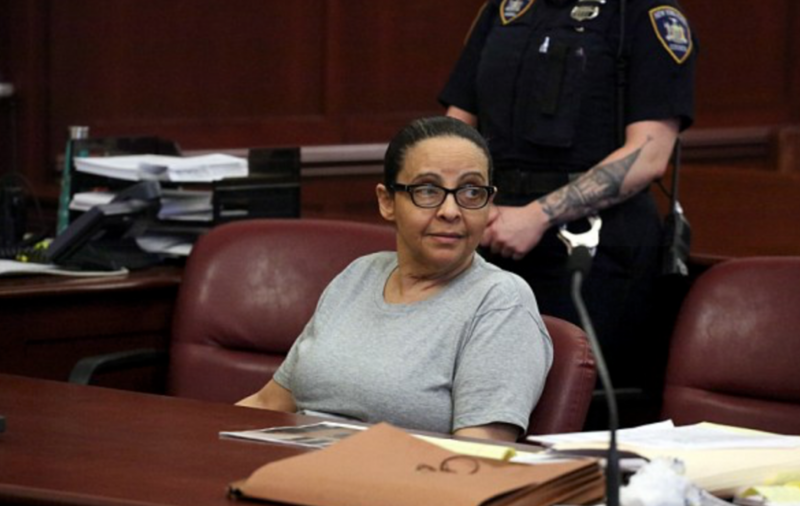 Yoselyn Ortega, 55, is currently on trial (above in court last Friday) charged with murdering siblings Leo and Lucia Krim in their Upper West Side apartment back in October 2012. In her first statement to police following the murders, Ortega complained about the children’s mother, the New York Post reports. I had to do everything and take care of the kids,’ she said when she woke up in hospital. ‘I worked as babysitter only and she (Krim) wanted me to do everything so wanted 5 hours of cleaning every week.’Ortega also said she didn’t want to clean, ‘because of soap’. Hidalgo told jurors she pointed to her pinky finger after making this statement. In the days before the killings, Marina said Ortega had shown her a bleach burn on her pinky finger. Marina went out and bought natural cleaning products, she testified in court last week. She also said she paid Ortega $100 extra per week for the five hours of cleaning, according to the New York Post. Speaking about taking down Ortega’s statement, Hidalgo said: ‘When I got things wrong she would make a grunting, gargling sound. She would tap on the railing. She would show frustration. Even small facial expressions, she would make.’Ortega has claimed she heard voices and was ‘touched by the devil’, which drove her to kill the young children in October 2012. Psychologists have refuted this, but the 55-year-old – who is on trial – has pleaded not guilty, claiming insanity. On March 2, Marina stormed out of the courtroom after screaming at Ortega. ‘You’re evil and you love this! You like this!’ Krim screamed, wailing ‘Get me out of here. Please, get me out of here. Get me out!’ as she was escorted out of the courtroom by court officers for a short break. The judge told jurors to disregard the outburst. Prosecutors say two-year-old Leo was stabbed five times and his six-year-old sister Lucia, also known as Lulu, was stabbed 30 times after she fought back. Ortega had allegedly grabbed the two kitchen knives and butchered the children while their mother was blocks away at a dance studio where Lulu was supposed to be. It is claimed Ortega waited until Marina had found her children dead in the bathroom before plunging a knife into her own neck so that she could relish in the devastated woman’s pain and horror.Ortega was supposed to pick up Lulu from kindergarten and walk her to dance class before going home to put Leo down for nap. The children’s mother had taken her other daughter, three-year-old Nessie, to a swimming class. Marina had shown up to the dance studio to pick up LuLu and panicked when she noticed her daughter wasn’t there. She frantically texted Ortega: ‘Where’s Lulu… Donde Estas… Where are you’ but Oretga never answered. Jurors were also shown photos of the blood-spattered bathroom where the bodies of the children were found with their eyes open. The bottom of the bathtub was almost entirely red. At least two jurors wiped away tears as they took in the horror images, while others gasped and held their faces. The photos were taken roughly seven hours after Marina found her children’s bodies and saw Ortega stabbing herself in the neck. During his testimony, Ortega sat in court, shaking her head, and pursed her lips and told her lawyer: ‘No, no.’ She faces a minimum of 20 years imprisonment if she is convicted and could be jailed for life without parole. The Krims use a Facebook page to post updates on how they are doing, writing about the arrival of two new children, Felix born in 2013 and Linus in 2016. The couple started the Lulu and Leo Fund, which aims to support innovative art programs for children. They recently posted a video message on Facebook asking that people mention the fund as their case becomes news again. Please let us support them with our prayers and donation to their charity organisation.